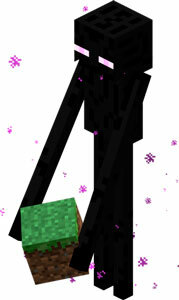 Endermans are neutral cratures which you can find both in The End Dimension, and Minecraft Overworld. It is very tall, with very long arms and legs. Its body is black and its eyes are between pink and purple. There are always purple particles floatin around its body. They have the ability of randomly teletransporting, without having a certain target. Another curious feature of its creature is that they take blocks from any part of the world to bring it with them. The Endermans are neutral creatures that will only attack the player when it stares directly to the eyes. In this case, they will open their mouth, and will start to emit terrorific shouts and sounds and will run directly to the player to hit him. Endermas spawn both in the Overwolrd and in The End dimension. In the Overworld they spawn when the level of light is 7 or lower, and they will appear individually, while in The End, they will appear always in gorups up to 4.